When my third son went away to college, I decided to find some kind of volunteer work. I could not think of a more effective way to improve the common good than to help adults to read. The Literacy Council’s work seemed perfect. 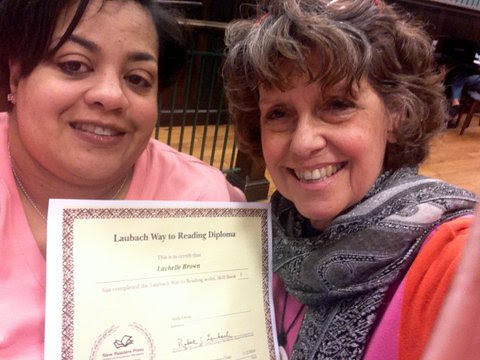 I was matched with Lachelle, a young mother of 2, who was very interested in learning to read at a higher level. As we worked together, one on one, Lachelle’s reading skills have slowly and steadily improved. She has achieved a new level of fluency. Her goal is to read well enough to get a job working with young children. She works steadily and deliberately and is always ready for a new challenge. As her reading has improved, her self confidence has grown. As I teach Lachelle to read, she teaches me things too. Lachelle has taught me that even though the road ahead seems very long, taking one step at a time, you can proudly travel down that road. And possibly our most important achievement, Lachelle and I have become friends. Previous post: 2014 AACLC Social A Huge Success! Next post: Great Give Donations Will Be Doubled: May 7-8, 2014!